Mortgage lending compliance costs have increased nearly 30% in 2014. In addition, the majority of senior mortgage executives polled in a recent survey stated that new rules and regulations issued by the Office of the Comptroller of the Currency (OCC), Consumer Finance Protection Bureau (CFPB), Federal Reserve and Federal Deposit Insurance Corp. (FDIC) have had “significant” impact on their business. So why are real estate lenders still managing their own appraisals and related compliance functions? Offload the burden of appraisal management and compliance. 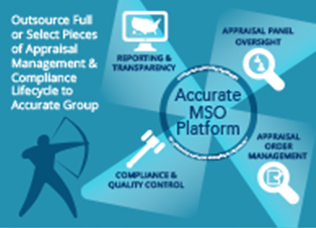 By taking on the role of outsourced managed service provider, Accurate Group allows mortgage lenders to offload resource and capital-intense overhead functions related to appraisal management and appraisal compliance. The full-service, nationwide solution can help your firm significantly lower costs, deliver continuous regulatory compliance and focus more resources on core business functions such as loan originations and client service. Flexibility and transparency delivered your way. Lower costs, ensure compliance and focus on your core business. Next generation technology improves processes and keep you informed so you benefit from greater efficiency, less hassle and continuous compliance. Eliminate fixed overhead costs and ensure your firm is stays compliant with changing regulations – contact Accurate Group today to learn more about how our managed services offering can help you.